Order Lifeplan Activated Charcoal 30 caps from the Online Health Food Store UK. 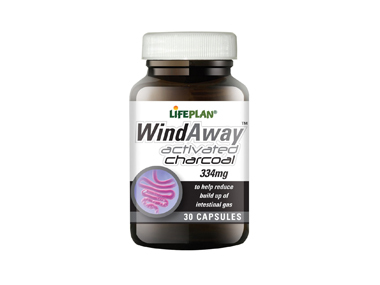 Buy Lifeplan WindAway Activated Charcoal - 30 capsules and other quality Digestive Aids safely online in the UK. WindAway contains activated charcoal to help with the build up of intestinal gas. This product contains pharmaceutical grade charcoal which is derived from coconut shells. WindAway (activated charcoal) 334mg contains activated charcoal to help with the build up of intestinal gas. This product contains pharmaceutical grade charcoal which is derived from coconut shells. To help reduce excess flatulence, take three capsules at least half an hour before a meal and three capsules shortly after eating, as required. Where to buy Lifeplan Activated Charcoal 30 caps safely online? Shop at the Online Health Food Store if you are wondering where you can buy Lifeplan WindAway Activated Charcoal - 30 capsules safely online in the United Kingdom. Activated Charcoal 30 caps - Lifeplan WindAway Activated Charcoal - 30 capsules in Digestive Aids and Herbal Remedies, Tinctures & Supplements.